I had the time, energy and obsession to check out Farmer’s Market in Cubao yesterday. What greeted me was their wide selection of seafood and other kitchen-must-have-now items. The fishes I saw were so fresh that I caught them wiggling and jumping up and down in the metal containers that contained water. That, to me, was the most credible seal of freshness. What a sight to behold! Where was my camera when I needed it the most? Okay, I literally cruised the fish stalls to search for some great find of fishes. Was hoping to get some seabass (locally known as apahap) to go with my mint sauce but, unfortunately, they didn’t have it yesterday. Anyway, the abundance of fresh, varied and great-tasting fishes they sold was enough to choose from. I saw some great catch of yellow fin tuna, mackerel, catfish, mahi-mahi, salmon, etc. As I scanned the fish selection, I was, almost simultaneously, blueprinting my menu for the day.I got some gorgeous cuts of salmon for my sushi, tuna belly and slices of blue marlin. Blue marlin should be the first in my firing line, I thought. And, so it was. Lunch was grilled Blue Marlin that went with my binagoongang kangkong. What did I do? 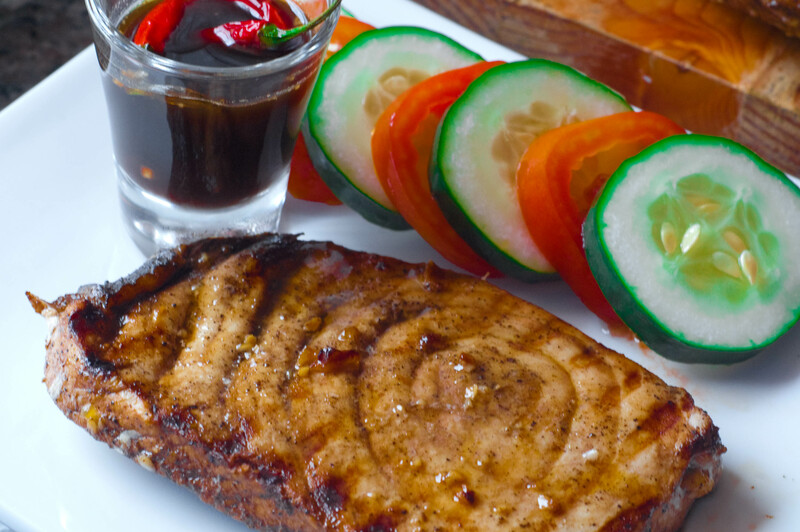 I seasoned 2 medium sized Blue Marlin slices with rock salt and pepper, marinated them in about 4 tbsps of soy sauce, juice of 3 calamansi and minced four cloves of garlic for about 15 minutes. Grilled for 7 minutes on each side while brushing marinade on them as they grilled. Served them smokin’ with the dressing of 3 tbsps white vinegar, 1 tbsp soy sauce, juice of 1 calamansi, 1 clove of minced garlic and 1 red chilli pepper. Delish, healthy and quick cooking. Amen? Amen! why don’t you have a resto Caren?? grabeng mouth watering naman ito! !